On the 17th may 2017, our Andrew made history in Portsmouth. Andrew was giving by the newly ordained lord Mayor, David Fulller the CIVIC AWARD for his outstanding contribution to his charity work. The “boys” after the awards ceremony celebrated at the A bar with the entire show team who perform in the charity events. 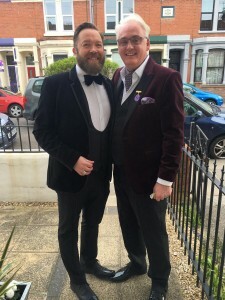 Rob and Andrew on their way to the dinner, Andrew wearing his CIVIC AWARD. In the evening Andrew and Rob were invited to the first mayors dinner hosted at the Mayors Chambers where they celebrated with other award winners. 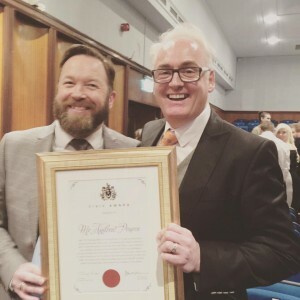 Andrew Pearce aka Miss GA female impersonator who has raised thousands of pounds for local causes was recognised by the Lord Mayor yesterday. 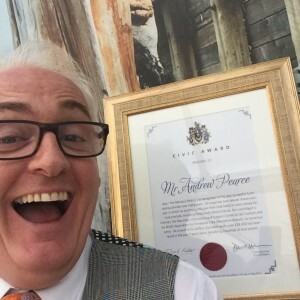 Andrew Pearce, aka the Fabulous Miss G, was presented with a civic award at the mayor-making ceremony at the Guildhall. 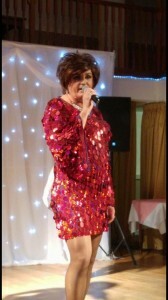 Over the years, his popular shows that are held at the Royal Maritime Club in Queens Street have helped raised cash for several charities including Portsmouth Breast Friends and more recently, Holly’s Wishes, for which over £5.5k was raised to buy a bladder scanner for the Urology department at QA Hospital. 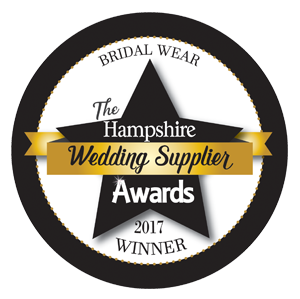 Andrew said, “This was the ultimate award that I could ever have dreamed of gaining. It wasn’t just for me. Even though it is always me that organises the shows, it was for the entire show team that helps on the Miss G events and the ongoing support of my dear husband Robert Pearce and the always supportive and hard working Sandy Williams. “As for the fabulous Miss G, she will be clicking her heels on the 29th October at the Lord Mayor’s charity event. This show looks to be a sell out. It’s called the ‘Magic of the Musicals’ and I think there may be a fight for the best Dorothy costume.